So, the Daredevils have finally made it to 126 CONTI, and it turns out to be a house of ill repute. Hopefully, like Joe, you did not see this turn of events coming. Admittedly, we did muddy the water a bit by throwing in bits of speculation about the letter’s recipient – descriptors like “Gnarly Ol’ Cuss” and “Old-Timey Pirate” don’t generally lead to thoughts of beautiful women in various states of undress. Its called misdirection, folks, and we can be mean like that sometimes. Ha! In addition to surprise, hopefully you are as intrigued and exited as the full-grown male Daredevils at finding themselves among these ladies of the night. 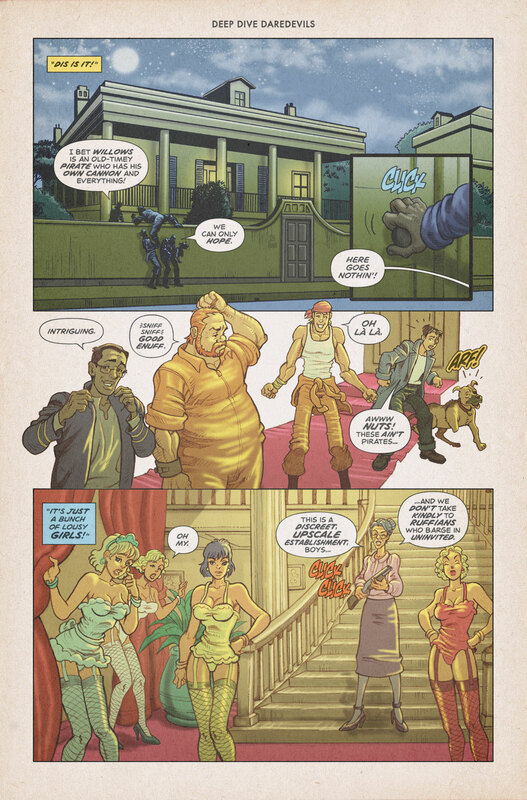 This is the kick-off to the final act of the CAJUN CAPER – only THREE more pages to go, and I guarantee an ending filled with emotion and a mystery/revelation that make you re-evaluate everything you (think you) know about the Deep Dive Daredevils! NEXT WEEK, the recipient of The Captain’s letter is FINALLY revealed! Who is M. WILLOWS, and what is their connection to Captain Custer? Find out in just 7 days! Also, don’t forget about Wooden-Nickel Sal! He can’t be far behind, right? RIGHT!? No matter how slice it NEXT WEEK’s page is a DOOZY! Make sure to RSS, Like, or Follow unless you want to risk missing out on this rollercoaster ride to the conclusion of the Cajun Caper! Why does the Song “House of the Rising Sun” come to mind? I’m betting these ladies (especially Shotgun Mary there) will prove stronger then initial appearances. Another great set-up! I’m wondering what gonna happen next and will it be ‘PG’? *L* Nice to see some ladies and well drawn ones to boot! Great page all around guys! Glad you are digging the Daredevils!